Here's a list of frequently asked questions concerning SHIMMER WOMEN ATHLETES. We will regularly make additions to this FAQ as time goes by so that it can become more complete. Please read through the FAQ before starting new threads asking questions, since odds are you can find the answer in the information below. 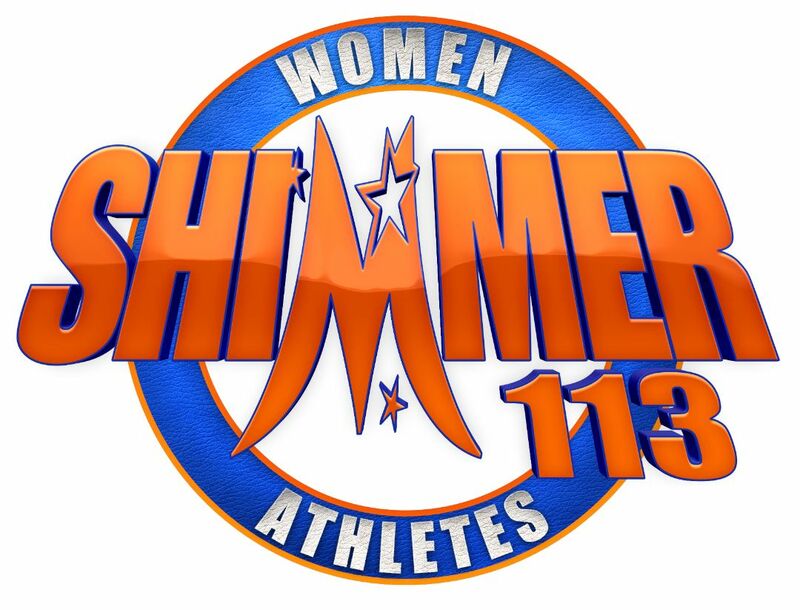 Q: What is SHIMMER Women Athletes? A: SHIMMER is an all female professional wrestling organization based in Chicago. 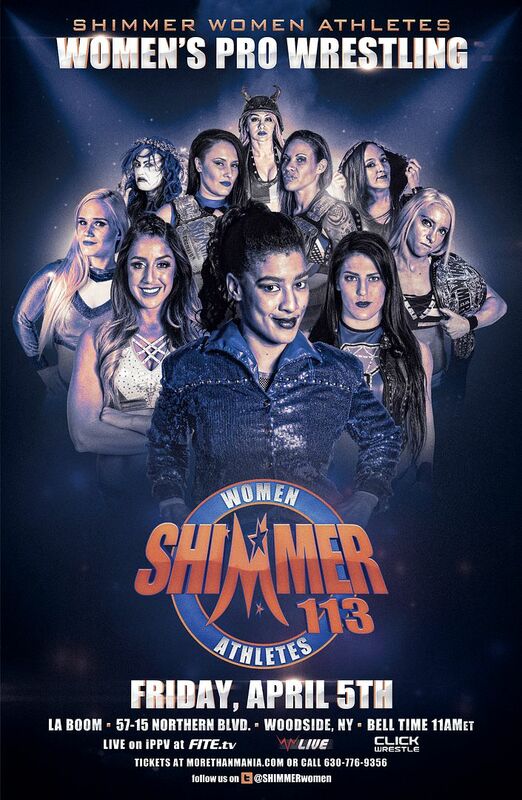 The goal of SHIMMER is to provide the most skilled women pro wrestlers with a forum to truly shine as athletes and perform at the most competitive level. SHIMMER management has selected an elite crop of women from around the wrestling world who are determined to show that women's wrestling isn't just a modeling contest, it's an athletic contest. Q: When did SHIMMER start? A: The formation of SHIMMER was announced publicly in a press release on October 4, 2005. The first SHIMMER event was held at the Eagles Club in the Chicago suburb of Berwyn, IL on November 6, 2005. 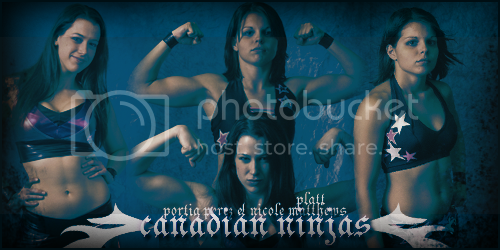 The show consisted of 18 women wrestlers from around North America. Q: Is SHIMMER a family friendly wrestling show, or is it adult oriented in terms of content? A: SHIMMER takes pride in being a women's wrestling product that you can bring your kids to, which is suitable for all ages. Q: What's this talk of "tapings" and "it's a DVD product?" A: Recognizing the successful business model implemented by Ring of Honor and other similar smaller wrestling promotions, SHIMMER has focused on producing a DVD product to sell worldwide as its main source of revenue. SHIMMER spares no expense to bring in the most talented and deserving female wrestlers, regardless of where they are geographically located. As a result, the high cost of flying in over twenty wrestlers for each live event necessitates filming two DVD releases at each live show. Since 2009, SHIMMER has made a habit filming four DVDs in a weekend, with two consecutive days of live events for fans to plan a trip to attend live. Q: What was SHIMMER's connection to Ring of Honor? A: SHIMMER began as a "sister promotion" to Ring of Honor, which was the main distributor of SHIMMER DVD releases from 2005-2011. Beginning in mid-2011, SHIMMER switched to distributing the DVDs ourselves via www.SHIMMERwrestling.com in an effort to put 100% of the DVD revenue back into our future live events. Q: How often does SHIMMER hold live events? A: SHIMMER typically produces nine new full length DVD releases during a given calendar year. Since 2009, our format has been two taping weekends per year, during which we film four DVDs over the course of a two day weekend of live events. Starting in 2013, we added to our schedule a single DVD taping in the city in which WrestleMania is taking place, the day before WWE's event. Our taping season takes place between the months of March and November each year. Q: Why doesn't SHIMMER run live events during the winter? A: Since we film our DVD series in Chicago, and we are so heavily reliant on smooth airline travel to bring all of the talent in for each taping, we cannot afford to risk scheduling a show during a time period when weather conditions often cancel flights, or close down the airports in Chicago. In 2006 we tried holding a taping during February, and due to snow, three key wrestlers were forced to miss the show, and an additional five wrestlers had their original flights cancelled because of the weather. We were lucky enough to be able to move those wrestlers to flights on airlines that were still operating that day, because otherwise we may have had to cancel the show entirely. We can't afford to take a risk like that again, with over twenty flights for each taping, so we've simply declared the winter months to be SHIMMER's "off season." Q: Why doesn't SHIMMER tape more frequently? A: The bottom line is, women's wrestling is a niche product. With as much wrestling as is currently available on free television, DVD, and on the internet these days, there isn't a big enough market to support more than 8 new DVDs of a women's wrestling product such as ours over the course of a year. From a financial standpoint, SHIMMER cannot take the risk of flooding the market with so many video releases that the majority of our fans couldn't afford to purchase all of them. We need strong sales numbers for each and every DVD we produce in order to remain in operation, so we limit the number of new releases each year to a reasonable number for our fan base to support financially support. Q: What is the World Wrestling Network, and what does it have to do with SHIMMER? A: The World Wrestling Network is the company in Tampa, FL which handles all of the editing of the video releases for SHIMMER, SHINE, Full Impact Pro, EVOLVE, and a handful of other independent wrestling promotions. Q: Why are many of the early SHIMMER DVDs no longer available for me to purchase? A: Our product is released on actual DVDs, not burned DVD-R's. As a result, we must order each DVD title in bulk. Once we sell through all of the copies of each DVD title, it becomes out of print. We are a small company, and it isn't financially logical for us to place a bulk re-order of a DVD we produced four or more years ago and hope that we sell enough copies to even cover the replication costs. Though the day may come that we re-issue earlier releases in the series, we can only currently afford to produce a single run of each DVD title. Q: What's with the retail versions of Volumes 1 through 6 that are out there? A: Several years ago, we released Volumes 1 through 6 of our DVD series in retail through Big Vision Entertainment. The retail release of those DVD titles is slightly different from the first edition copies. The main difference is that the entrance music has been removed for distribution of our matches in retail. The actual bell to bell action in each match appears in its entirety on both versions. The cover artwork is also slightly different for the retail version of each release. Also, beginning with Volume 5, the retail versions include a Photo Gallery section, which is a feature that is not included on the first run. Volume 6 was the last DVD title which we released in retail. Q: What is www.ClickWrestle.com and what are its ties to SHIMMER? A: ClickWrestle is a wrestling video on demand service through which you can purchase individual matches for viewing on your computer. They are a business partner of ours, and offer SHIMMER matches for immediate download, in addition to matches from several other promotions from around the world. The entire SHIMMER video library is available from ClickWrestle on demand (which obviously includes matches from our out of print DVDs). Q: How much material has SHIMMER produced thus far? A: SHIMMER has produced over 280 hours of original video content as of July 2017. It is available in both DVD form as well as at www.ClickWrestle.com as video on demand. To date, SHIMMER has filmed 95 unique events, released as individual Volumes of first run material on DVD. Q: What is the "License Number" associated with each wrestler on the SHIMMER roster? A: When each wrestler participates in their first match on a SHIMMER or SPARKLE card, they are given a wrestler's license. The first two wrestlers on the first SHIMMER show were Tiana Ringer and Shantelle Taylor, so they were issued licenses #01 and #02. 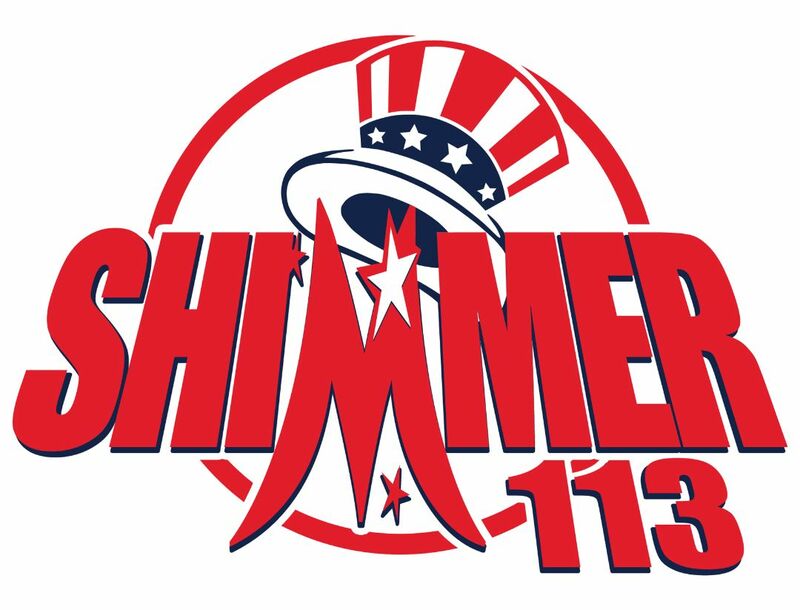 As of July 2017, SHIMMER has issued licenses to 180 wrestlers. Q: Which wrestlers left SHIMMER due to being signed to WWE contracts? A: Beth Phoenix, Krissy Vaine, Shantelle Taylor, Nikita, Nattie Neidhart, Serena Deeb, Amazing Kong, Sara Del Rey, Britani Knight, Rebecca Knox, Davina Rose, Tenille, KC Cassidy, Athena, Heidi Lovelace, Kimber Lee, Nixon Newell, Crazy Mary Dobson, and Evie are among the wrestlers who have left SHIMMER in the past after being given WWE deals. Q: Why have some SHIMMER wrestlers been able to appear on WWE and TNA shows without leaving SHIMMER? A: All of the SHIMMER wrestlers are independent contractors. We do not have any of our talent under exclusive deals. In the past, both WWE and TNA have booked some of the SHIMMER wrestlers on a nightly basis, without signing them to full time contracts. For example, several active SHIMMER performers participated in the WWE Mae Young Classic tournament in 2017 while still remaining active on the SHIMMER roster. Q: Several female wrestlers from Japan began appearing in SHIMMER during 2010. What are SHIMMER's ties to the joshi scene? A: SHIMMER has a working agreement with S-Ovation Company, Ltd, which produced live events in Japan under the IBUKI banner for several years, and more recently as Joshi 4 Hope. S-Ovation and Ring Stars are responsible for most of the joshi talent you see in SHIMMER. We have also worked with freelance joshi talent, such as Kana. Q: Why does SHIMMER film its DVD series at the Berwyn Eagles Club? A: We feel it is the perfect setting for our product on DVD. We'd rather fill a small venue than run a larger building which may have empty seats. We also have the necessary elements readily available to us at the Eagles Club to produce DVDs that look good on camera. Q: Is SHIMMER going to go "on tour" to other cities? A: We have no plans to take SHIMMER "on the road," with the exception of WrestleMania weekends. Again, we're primarily a DVD series, which means the most important aspect for our tapings is the appearance of the event location on camera. We have such a strong fan following in the Chicago area that we can fill the Berwyn Eagles Club without even announcing any matches, and the location looks ideal on camera. There's no reason to roll the dice and move the shows to other cities where we may not have a big enough following to draw a respectable crowd, and may not be able to set up our live production in the appropriate way. Q: Why did SHIMMER wait until Volumes 11 & 12 to crown a champion? A: We made the decision to wait until the promotion had developed a fan base that was familiar with the various members of the roster before holding a tournament to determine a champion. Q: Who made the SHIMMER championship belts? A: The SHIMMER Championship and SHIMMER Tag Team Championship belts were designed by Rico Mann, and were crafted by the "King of Belts" Reggie Parks. This is the same team responsible for many of the current belts you see today, including the IWGP Heavyweight Championship as well as all of the belts in TNA and the UFC. The Heart of SHIMMER Championship was designed and crafted by Christian Lons at Belt Performance. Q: Will we ever see a SHIMMER television show? A: We have no aspirations of producing a television show. We are a DVD series, and we believe in "if it ain't broke, don't fix it." As a live event and DVD product, we have the freedom to produce the kind of matches which we wish to present to our fan base. In doing television, a wrestling company must answer to the network in terms of content. Not to mention, there are additional expenses involved in producing television which make the idea of doing TV something we're just not interested in. Q: What is SHIMMER's stance on running pay-per views or internet pay-per-views? A: As of July 2017, we have run five live iPPVs. They were SHIMMER 53 from Secaucus, NJ on April 6, 2013, SHIMMER 62 from New Orleans, LA on April 5, 2014, SHIMMER 71 from San Jose, CA on March 28, 2015, SHIMMER 80 from Dallas, TX on April 2, 2016, and SHIMMER 91 on April 1, 2017 from Fern Park, FL. All five events took place during WrestleMania weekend, in conjunction with other World Wrestling Network shows, including EVOLVE. As the necessary equipment to produce a live iPPV was already in place for those events, we made our shows available as well. We do not have plans to do iPPVs from the Berwyn Eagles Club, mainly due to the venue lacking a reliable internet connection to do so. Q: Is there a SHIMMER wrestling school for women interested in becoming a part of the SHIMMER roster? A: We previously operated a SHIMMER class in conjunction with Ring of Honor's school in Pennsylvania. When our working relationship with ROH came to an end, so did our connection to their training program. We do not currently operate our own school. Q: Is there an official SHIMMER mailing list? A: Yes. There are two, actually, and we encourage everyone to sign up for both in order to stay informed about the latest happenings, DVD releases, and other information from SHIMMER management. We have our Yahoo Group, located at groups.yahoo.com/group/shimmerwrestling/ which serves as our E-mail list. Make sure you adjust your settings to receive "individual E-mails" when you join the group, or else you won't get sent each update. We also have a snail mail list, to which we send *FREE* glossy flyer cards prior to each taping. We send the free glossy cards to everyone who wants them, no matter where in the world you are located! If you aren't already on the list, E-mail shimmernews@yahoo.com with your full name and postal mailing address, and you will be added. A: SPARKLE is the pre-show at the live SHIMMER events. It serves as a method of trying out potential new female talent for future appearances on the SHIMMER DVD series. Since the SPARKLE matches exist specifically to be dark matches for evaluation purposes, we do not sell the SPARKLE matches on video. We occasionally post one of the better SPARKLE matches on YouTube for free viewing. Q: At the live events, is there an opportunity to meet the wrestlers, get autographs from them, and get pictures taken with them? A: Yes. We hold an intermission between the filming of the two DVDs at every day of taping, where you can interact with the wrestlers and purchase merchandise items from them. You can also interact with the wrestlers at the official after party following each taping. We encourage you to buy your favorite wrestler her food and drinks as a way of showing your support! Q: Where is the after party, and is there any age requirement to get in? A: The SHIMMER after party location varies from taping to taping, but we always select a location which permits fans of all ages to attend. It has previously been held at both Michael Anthony's Restaurant & Bar on Ogden Ave. in Berwyn, 39TEN Lounge (which has since closed down) in Lyons, and Paisans Pizzeria & Bar, also on Ogden Ave. in Berwyn. Q: I'd like to help spread the word about SHIMMER to other fans. How can I be of assistance? A: We encourage our fans to spread the word about the SHIMMER live events and our DVD series to other fans online. 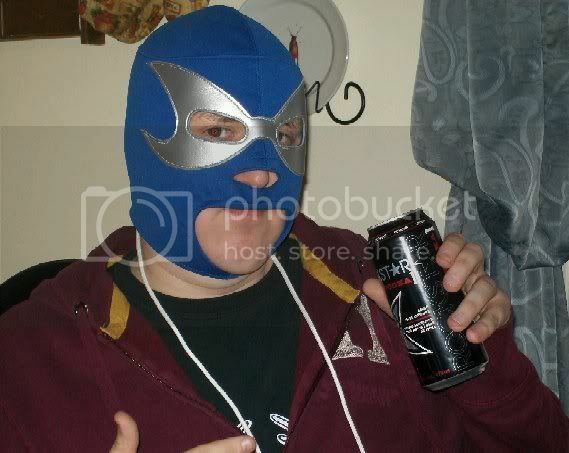 Adding links to www.SHIMMERwrestling.com to your signatures on message boards, posting reviews of our DVDs, etc. all help us in many ways. If you live in the Chicago area and would like to help distribute flyers promoting our upcoming tapings in your area, E-mail shimmernews@yahoo.com expressing your interest. Q: How can I contact SHIMMER? A: You can reach us by snail mail at SHIMMER Women Athletes, PO Box 3294, Lisle, IL 60532, USA. Our voicemail/hotline number is 630-776-9356. Contact dave_prazak@yahoo.com to reach us by E-mail. This Saturday and Sunday, SHIMMER to live action in the Chicago area, followed by our return to the New York area next weekend! All of the events will be streamed live on both the FITE and WWN Live services, and the individual matches will be made available for later download at ClickWrestle! The Berwyn iPPV broadcasts will be available as "All Day Passes," featuring both full length shows that take place each day (over five hours of live matches)! Below is a look at the upcoming event schedule for these next two weekends, along with links for tickets and the iPPV feed options. Plus much, much more on Saturday! Matches which will take place on Sunday, 3/31 will largely be determined by what happens on the Saturday shows. Look for several bouts to be announced for Sunday before the conclusion of the Saturday live event, as well as additional matches announced on the web site and social media on Sunday morning. Further details, including ticket information, as well as official talent announcements for The Summit, will be made available during the coming weeks at www.smash-wrestling.com. Several championships from the involved promotions will be at stake, and fans will have the opportunity to see a wide variety of talent during The Summit, on Saturday, August 10th in Toronto! 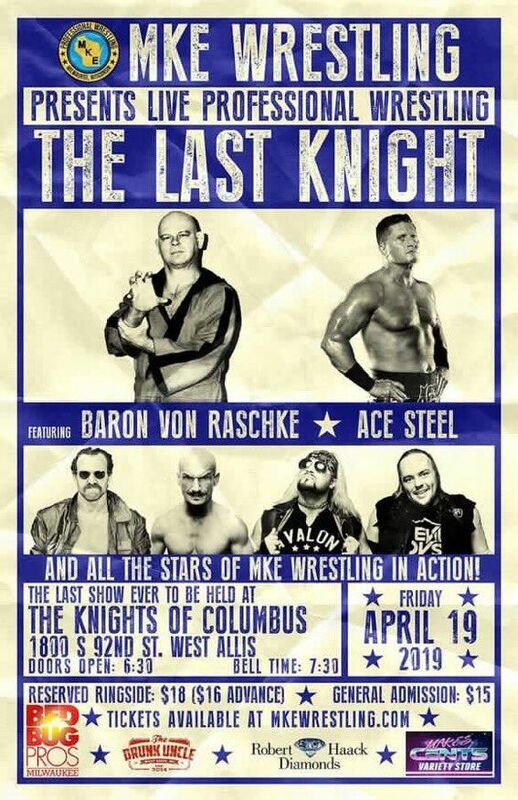 This Friday night, April 19th, will be the last pro wrestling show ever held at the Knights of Columbus in West Allis, WI. This venue has decades of history behind it, from being the home of Mid American Wrestling during the late 90s, to Brew City Wrestling, and now MKE Wrestling. The legendary Baron Von Raschke will be making an appearance at the event, which will also feature Ace Steel, Dysfunction, and more on the card. Join us to say farewell to the Knights on Friday. You never know which wrestlers from years past may show up to send the venue off properly! MKE Wrestling presents "The Last Knight"
Is SHIMMER ever coming to Orlando? Did you miss these two? A: We have no plans to take SHIMMER "on the road." Again, we're primarily a DVD series, which means the most important aspect for our tapings is the appearance of the location on camera. We have such a strong fan following in the Chicago area that we can fill the Berwyn Eagles Club without even announcing any matches, and the location looks ideal on camera. There's no reason to roll the dice and move the shows to other cities where we may not have a big enough following to draw a respectable crowd, and may not be able to set up our live production in the appropriate way. Q: I noticed that Volume 14 was filmed in Florida, rather than Illinois. 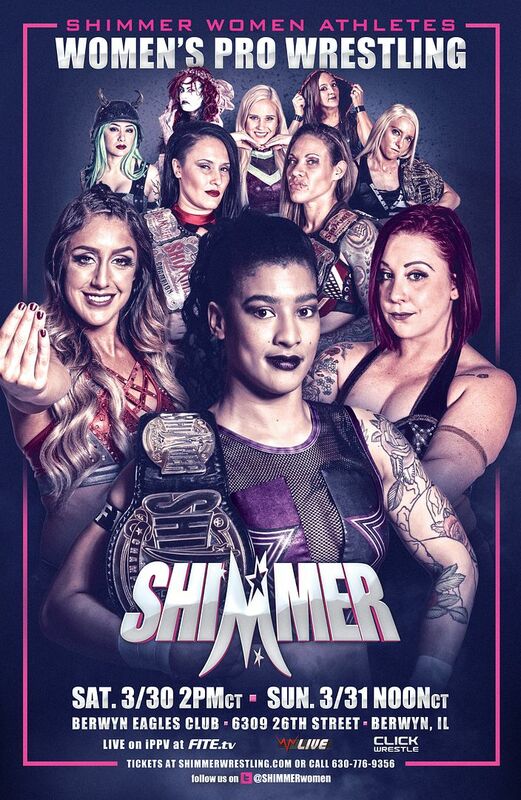 Will SHIMMER be returning to Florida for future events? A: We held the Volume 14 event in Florida in cooperation with both Full Impact Pro and SLAMminLadies.com. The opportunity presented itself to run a live event in that region at minimal financial risk to us, so we gave it a shot. Though we have not ruled out running an occasional show in Florida in the future, our main focus is on running shows at the Berwyn Eagles Club from this point forward. I meant to ask something about the TNA/SHIMMER deal. How does it affect former/inactive TNA talent, like Rain/Peyton Banks, as well as characters whose likeness in TNA is a million miles away from their SHIMMER characters - the most obvious example being Raisha Sayed/Cheerleader Melissa? I've see Amazing Kong and Nikki Roxx use their TNA personas on other indy shows, so I would assume they could in SHIMMER too. That's not what I mean. What I mean is because Melissa's TNA character isn't directly comparable to her SHIMMER character, does it mean her Cheerleader Melissa likeness is still fine to have on Big Vision releases? Human beings have contracts, not characters. Unfortunately, we couldn't get away with Mickie James on SHIMMER as Alexis Laree any quicker than we could release DVDs in retail with the TNA talent using different names. The way I see it, when you book a talent from any sort of major company, you do so under a signed contract or agreement. And in that agreement, you're told what you can and can't do with the footage shot under the terms. That contract language shouldn't change when the talent's status with the company does so. I have a question that I hope can be answered here. What versions of the DVDs are on Highspots. Like if I order volume 13-14 through there, am I getting a retail version or the original? You would have to e-mail them on the week you're buying to make sure they still have the original DVD of what you're looking for. The only titles that exist in retail form as of now are Vols. 1-6. Everything past that is the first edition, anywhere you buy from. So to confirm what I'm thinking, this means that although they, they being the Knockouts, can participate in SHIMMER; however, this also means that when those participular SHIMMER volumes are released mainstream, Amazing Kong, Nikki Roxx, Cheerleader Melissa, and any others WILL NOT be on them? Also, the reason that the entrance music is removed is because of copyright, correct? And would this mean that even the legendary VOLUME 9 WOULD NOT have Kong, even though it's the most featured match in that taping? I may be wrong on this but I think it's only volumes taped after the agreement that are subject to having TNA contracted talent removed from the retail release. So as the agreement was not in place at the time of it's taping Volume 9 would be left intact.